Tana Toraja, literally "Torajaland", is a highland region of Southern Sulawesi in Indonesia. Tana Toraja, the famed "Land of The Heavenly Kings", lies about 328 km north of Makassar, the capital of South Sulawesi Province,in the central highlands of South Sulawesi. The land of the Toraja people (many nominally Christian but most, in practice, animist) is above all famed for their spectacular (and rather gruesome) burial rites. After a person's death, the body is kept — often for several years — while money is saved to pay for the actual funeral ceremony, known as tomate. During the festival, which may last up to a week, ritual dances and buffalo fights are held, and buffaloes and pigs are slaughtered to ferry the soul of the deceased to the afterlife (puya). 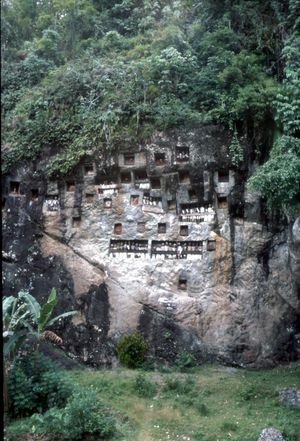 The deceased is then finally buried either in a small cave, often with a tau-tau effigy placed in front, inside a hollow tree or even left exposed to the elements in a bamboo frame hanging from a cliff. Tana Toraja has unique culture set in stunning scenery. Globalisation and tourism may have impact, but if you venture away from the tarmac roads you will find soon a way of life that has not changed much in the last 100 years. Traditional Tongkonan houses stand proudly in this setting. These intricately decorated houses with upward-sloping roofs are the center of all Aluktodolo (Torajan religion before the coming of missionaries; the ancestors belief) rites; from storing the harvest in the carved rice barns, "alang", to slaughtering sacred water buffaloes at a week or more-funeral ceremonies. Tana Toraja's beauty is also reflected in its people. Although they are devoutly Christian (there are small number of Muslims especially in the southern area), they combine this religious belief with magic and mysticism, and welcome visitors to witness their ceremonies. Tana toraja is a sleepy rural region cultivating rice, cacao, coffee, and clove most of the year. Toraja's arabica coffee carries a high reputation and is something that visitors may be interested in trying. These all change during the dry season,, from June until September, when Children are home from school, the rice is harvested and it's time for a "rambu solo", a complex funeral ceremony of the ancestors. During the time, Rantepao is transformed into a major tourist resort for national and international visitors. At 300 to 2,880 metres above sea level, Tana Toraja combines tropical lushness with alpine freshness, with daily temperatures between 16 degrees Celsius to 28 degrees Celsius. Bright green rice terraces, tall limestone outcrops and bamboo graves are set against a backdrop of blue misty mountains. Toraja is in the UTC+8 time zone (known in Indonesia as WITA, Waktu Indonesia Tengah), same as Western Australia, Kuala Lumpur, Singapore, Hong Kong, Bali and one hour ahead of Jakarta. Electricity is supplied at 220V 50Hz. Outlets are the European standard CEE-7/7 "Schukostecker" or "Schuko" or the compatible, but non-grounded, CEE-7/16 "Europlug" types. American and Canadian travelers should pack a voltage-changing adapter for these outlets if they plan to use North American electrical equipment (although a lot of electronics with power adapters will work on 220 volts, check your equipment first). Prime funeral season is after the harvest in July to October. From the Hasanuddin Airport in Makassar, one can fly to Tana Toraja or vise versa. 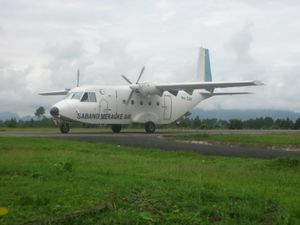 Susi air is flying Makassar to Tana Toraja and vice-versa three times per week on Mondays, Wednesdays and Sateurdays. The price is 775,000rp. Tana Toraja is a solid 300-km, 8-10 hour drive from Makassar. There's several bus companies making the journey from Makassar to Rantepao and Makale The cost is 70,000 Rupiah for a bus without air-conditioning all the way up to 150,000 Rupiah for an air-conditioned bus. There's morning and overnight buses. Frequent mikrolets/bemos leave from Makassar to the bus terminal and take about 40 minutes. Most buses from Makassar to Tana Torajo are clean and comfortable. Please note however, that if you intend continuing further north, the buses are generally slower, in poorer condition and far less comfortable. Always take care of your belongings when travelling overnight. Thieves are known to board the night buses and search your bags while you are sleeping. A chartered car usually costs about 850,000 - 1.200.000 Rupiah one-way from Makassar. It is possible to find one for a few hundred thousand less if you can coordinate with someone who is driving in that direction. If you plan on staying for a few days and would like the return trip as well, a driver with car should cost about 550,000 Rupiah per day. Please beware that if you are planning to drive your own car, the stretch of road from Makassar, starting from Maros district area up to the town of Pare Pare is currently undergoing a road widening works. You may have to suddenly switch onto the opposite lane, because the lane you are on is blocked for the construction work. Be very careful and watch out for this kind of roadblock, because road signs indicating this are virtually non-existent. This problem is made incredibly worse during night time by the absence of proper street lighting, so exercise extreme caution. The road from the town of Enrekang to Makele (the town before Rantepao) is a stretch of unlit, small, winding, uphill road, accompanied with some fog and drizzle at night. Along this road, you will frequently come across big buses going downhill from Makele. Gas stations are few and far between, with intermittent local shops along the way. Again, these conditions make nighttime driving best avoided. Bemo/mikrolet rides run from 2,000Rp for short rides of a few kilometers up to 10,000 Rp. A guide is useful for some of the more distant villages. Most hotels pressure you to hire a local guide for 250,000-300,000 Rp a day. Although it can be expensive if you are on a budget, a guide can provide a lot of insight into the local practices and customs. It is possible to visit most of the famous sites and funerals on your own, although information can be hard to find from most hotel operators. Funerals (tomate) are public events and served by public transport. Avoid offers by guides, telling you that they are private or difficult to access! ; ask the tourist information. Go to Tora Tora Primitive Art Gallery; it has a very friendly English-speaking owner who provides free maps of the area. It is on the main street in Rantepao. Pallawa — Pallawa site is also a compound of houses and granaries. In total there are 11 houses and 15 granaries. Bori Parinding — The site of Bori Parinding is a combination of ceremonial grounds and burials. The ceremonial ground is an open space used for traditional ceremonies, including rituals for the dead and thanksgiving. Kande Api — The site of Kande Api consists of a compound of houses and granaries, ceremonial ground and burial places. Nanggala — Nanggala site is principally a compound of 2 houses (tongkonan) and 16 granaries (alang), arranged in rows and aligned east-west. Buntu Pune — Formerly, the sites of Buntu Pune and Rante Karassik belonged to one integrated settlement. Rante Karassik — The site of Rante Karassik is a ceremonial ground on a sloping hill. Ke'te Kesu' — Among the nominated sites, Ke'te' Kesu' is the most complete settlement. The site consists of a compound of houses and granaries, burial place, ceremonial ground, ricefields and water-buffalo pasture. Pala' Toke' — The site of Pala Toke is principally a burial place located on a towering limestone hill, from where a rice field extends to the north, east and west. Tumakke — The site of Tumakke displays a distinctive traditional house built on a raised terrace. Kembira — Site of a burial tree for babies. Entrance fee 20,000Rp (Oct 2015) for a 1 minute visit. Don't go there, it's a tourist trap. There are many walks (1-3hrs) that pass by many different types of grave sites, including the most popular sites. Most can be reached by short bemo rides from Rantepao and do not require guides. There are some restaurants in Rantepao and Makale. They serve menus of Indonesian, Chinese and western food. Torajan specialties, such as pa'piong (chicken/pork or fish cooked with vegetables in bamboo tubes) is also available and usually must be ordered in advance. Local Torajan palm wine (ballo) is also easily found. Ballok. Buy it on the street. The darker the stronger, but be warned, it can be very strong. The Tana Toraja region is famed for its coffee. In your local coffee house it will cost a small fortune. Drink the real thing here for a fraction of the cost. There are also a number of non-star hotels, home-stays and local residences available for accommodation, generally in the range of 100,000-300,000. Most of the hotels provide standard facilities such as single and double bed, hot and cold water, telephone line, entertainment, meals while some provide additional ones like sports facility, spa and massage, laundry and others. The hospital is fairly serviceable by developing world standards, however, for serious problems you should return to Makassar.